Do the four blood moons of 2014-2015 signal that some other great event is near? Will you regret it if you ignore it? Or is the theory flawed in ways that are easy to miss? Discover the prophecy breakthrough that invalidates this theory by someone who had the same eclipse table idea years earlier. Plus find out how Revelation says our year will drop to only 360 days after the real prophesied blood moon eclipse happens. Joel 2:31 (HCSB) — The sun will be turned to darkness and the moon to blood before the great and awe–inspiring Day of the Lord comes. Joel and Revelation seem to plainly describe an end time solar eclipse and lunar eclipse. During solar eclipses the sun is obscured by the moon except for wisps of light around the corona as if a hairy sackcloth was put in front of the sun. Lunar eclipses often cause the moon to not disappear completely but turn shades of orange and red (for the same reason that sunsets and sunrises often are reddish). Since science has long been able to calculate and publish upcoming eclipses in advance, Mark decided to try to use this data to find the year when this eclipse prophecy might be fulfilled. His intriguing discovery caught the attention of prophecy buffs everywhere. In April, he did a video interview  with ProphecyInTheNews.com. Later that month WorldNetDaily.com did an article  summarizing the interview. In it resident columnist and author Hal Lindsey of Late Great Planet Earth fame called the theory "pure speculation." Because the four blood moons are so rare, people naturally reason that they mean something signficant has to happen. They adopt the typical wait-and-see posture about this latest prophetic speculation. In 2013 his theory seemed break out on a larger scale and get picked up by by many other prophecy ministries and teachers, each putting their own spin on the meaning of the tetrad. Rather than talk about Jesus' return in 2014 or 2015 like Mark Biltz did, now the idea is that it may herald the Great Tribulation or a war involving Israel or persecution against Israel. Per usual, a few outright refute the idea because it contradicts their view on side issues such as the rapture timing. Interestingly, among the many responses I read nobody seemed able to debunk the very basis of the theory - whether we can use current eclipse projections to predict when the 6th seal will be. That's what I'm about to do. I am qualified to do so because I had the same idea back in 2003. I, too, saw the possibility that the 6th seal could refer to a solar and lunar eclipse pair and went to the same NASA site to look for years that might fulfill the prophecy. However, I never came up with 2015 because I determined from related verses that the 6th seal will happen around the Day of Pentecost (May/June) which rules out the spring and fall eclipses that Biltz reports. I was trying to find the right eclipse that could fit all the clues surrounding the event rather than a year with lots of interesting eclipses. But in the following year I ended up debunking the theory when I was chatting with a friend who I often bounced my prophecy ideas off of. I was telling him about how I was having no luck finding solar and lunar eclipses pairs that might fit the 6th seal in the NASA data. And then it suddenly occurred to me that this approach would never work because of Wormwood. Since 2002, I had been aware that Revelation says an unknown celestial body called Wormwood will pass through the inner solar system and be visible from at the 3rd trumpet. Because the NASA data for predicting eclipses did not factor in the gravitational force of this unknown object, they are useless for predicting the 6th seal eclipses that coincide with Wormwood's appearance! What Biltz missed is that in the subsequent chapters, Revelation reveals the cause of not only the eclipses, but the related global great earthquake, meteorite storms and asteroid ocean impact. It describes a veritable "death star" called Wormwood visible in the sky after all the above pass. (Note that the NT Greek word for "star," aster, is not specific to stars but can mean planets, meteorites, and comets as in Rev 6:12 or Mt 24:29 where the falling stars are obviously meteorites.) This catastrophic progression is similar to the rumors of a doomsday planet originally announced by NASA and misnamed Planet X which serious astronomers now discount and most everyone else considers a hoax (thanks in part to misinformation predicting its arrival on May 15, 2003). Although Revelation is very detailed in its account of Wormwood's catastrophic global effects, few seem able to accept it at face value. In fact, in the Biltz video interview, one of the hosts suggests that it's time to rethink the eclipses as describing an astronomical catastrophes and consider them to be normal scheduled eclipses! Both possibilities should definitely be considered. Yet when you read past the 6th seal and see that all the way up to 4th trumpet a sequential series of related cosmic catastrophes is described (Rev 6:12-8:13) it becomes obvious which explanation of the eclipses fits best. As a matter of fact, the most natural reading of Revelation's description of the solar and lunar eclipses implies they are simultaneous eclipses, which is impossible with normal predictable lunar and solar eclipses caused by the moon. Simultaneous solar and lunar eclipses would be possible because of the presence of near earth objects (NEO) brought close by Wormwood some of which are described as impacting the earth in the first and second trumpets. Because few take those passages literally, they miss out on one of the key points of Revelation needed to understand the complete roadmap it lays out for us. But more importantly to topic at hand, they miss out on an amazing hidden prediction that Revelation makes about a change to our orbit and calendar (hidden in plain sight). Think about how big an effect a another planet passing nearby could have on earth's orbit. It's easy to imagine that when another planet comes close enough to be visible that it will throw off our existing orbital clock. Current eclipse predictions would be invalidated. But this is not just speculation. Soon after my Wormwood insight, I was prompted to reconsider the rest of Revelation literally (except for the rare cases of clear allegorical language such as Rev 14:4). Consequently, I realized that Revelation and Daniel confirm in mathematical terms that earth's orbit will change dramatically after Wormwood's passage. In several places both Revelation and Daniel talk about the length of the Tribulation as either 3½ years, 42 months or 1260 days which works out to a 360 day year and 30 day month. Few take these numbers literally, just as they doubt the 144,000 are a literal number (because they assume it to be a count of all those saved when it's not), but now I was doing so. Because it's hard to imagine our calendar ever changing like that, most people explain these numbers allegorically calling them part of a mythical "prophetic calendar". But when you do accept them at face value, you come to the conclusion that the Bible is making a veiled prediction that earth's orbit would change enough from Wormwood to go from 365¼ to 360 days and along with it the month from 29½ to 30 days ( the lengthening of the lunar cycle is a predictable natural result of the earth orbiting the sun slightly faster). In January 2004, I posted an article on my website literally explaining this stunning mathematical riddle. For more details on this amazing insight including how Genesis and other ancient histories record 30 day months and 360 day years prior to the time of Hezekiah (the Hebrew calendar changed in his days), read the full 360 day year article . Wormwood is an undiscovered rogue planet that will pass through our inner solar system. It will be responsible for the unscheduled eclipses, global earthquake and the rest of the literal cosmic catastrophes described from the 6th seal through 4th trumpet. The Tribulation immediately follows the Wormwood catastrophes at the 5th trumpet because the Antichrist claiming to be God (2Th 2:4) will be the only one able solve the ensuing world war and global famine by bringing order and an efficient cashless society (he does not come to power by convincing everyone he is Jesus as some speculate). The given 3½ year/42 month/1260 day length of the Great Tribulation  is literal and confirms Wormwood or its satellites will so affect our earth that it changes our year to 360 days and month to 30. While Mark Biltz's blood moon eclipse insight is intriguing and brings needed attention to the 6th seal, his 2015 theory fails to take into account these important related details in the rest of the Book of Revelation that invalidate it. Despite his oversight, when I saw Biltz's interview I was pleased to see someone else taking Revelation literally (like the rest of the Bible) as it should be. Christians traditionally read Revelation like it was an allegory of symbols. Mainly for this reason Christianity remains unable to unravel the puzzle of end times Bible prophecy, even though the end times wisdom is now available to make sense of it (Dan 12:10). Besides this main oversight, there are several other errors in his interview statements that mar his presentation. Most of these derive from his dependence on the traditional Jewish calendar which is not the same as the original Biblical calendar (affecting the assumption that the eclipses fall on actual feast days or in a true Sabbath year). Another is a common mistake of equating Matthew 24's description of the sun and moon going dark when Jesus returns with the sun black and moon blood at the 6th seal. If you want to correctly understand the complete roadmap of Revelation, it's important to get these things right. 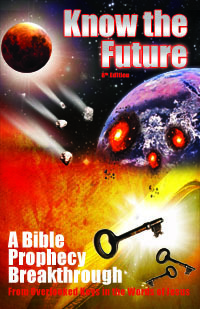 For a cogent and verifiable alternative to these errors and additional information on the topics covered in this article, see my book Know the Future, perhaps the last Bible prophecy book you ever need to read. My response is: I know that Mark Biltz never said "thus saith the Lord" or that it would happen for sure. I'm not accusing him of that nor of any sin or even being a "false teacher." I have only respect for the man for teaching people the Bible. 2. What not to watch for : A predicted time or day--since no man knows the time ("day or hour") (Mt 24:36)). If Christians could understand these two key points (as well as they do that Jesus is their savior), it would end the constant date setting and doomsday theory speculation. Believers would know based on events that had still not happened that "the end is not yet" as Jesus said and go about doing what he said to do with less fear and concern over what "might" happen every year. For more on these two themes from the Olivet Discourse, click through to the articles linked in points 1. and 2. above. Update #2: "How Do You Explain The Previous Seven Blood Moon Tetrad 'Events'?" Short answer: This is largely "confirmation bias " at work. Long answer: Confirmation bias is when we prefer information that confirms our beliefs or theories over information that contradicts it. This bias can be seen in the forgiving nature of the rules used to connect the seven tetrads to "events." Past tetrads only hold prophetic significance if you loosen the bounds of the criteria to encompass any "significant" event "near" the time they happen (before or after!). It's a form of self-deception to "move the goalposts" so wide that you can find something subjectively considered "significant" and declare, "Aha! This happened because of the tetrad!" It's just like when the last pope resigned. The next pope according to the Malachy prophecy was to be Peter the Roman. But is that his name? His nationality? Nickname? It doesn't say. It's just that vague and open for interpretation, much like horoscopes are. Because of this, I told people that no matter who his replacement would be, people would rise up to assure you that he did indeed fulfill the sense of "Peter the Roman." And that's exactly what happened when Pope Francis was chosen thanks to confirmation bias. Think about it: what heavenly signs can't you attach significance to if you are given up to a year before or after the sign to find a "significant" event that you can connect it with? None if you simply continue to use subjective, arbitrary pattern matching. Likewise, to conclude that "special" events were "tied" to past tetrads is contrived and not based on sound reasoning. Thus, to expect a tetrad in the future to be a prophetic marker is speculation. The Bible does not tell us to watch for tetrads nor does it ever attach any significance to them prophetically. While it talks about a blood moon eclipse at the 6th seal, it actually is associated with what seems to be a solar eclipse (and earthquakes, and shooting stars, etc. ), not one or more other lunar eclipses (Rev 6:12). In conclusion, I do not see any reason based on the past tetrads or on the Bible to expect anything special with the 2014-2015 tetrad. Update: What About Genesis 1:14 "Let the heavens be for signs"? It has been shown above how the blood moon tetrad theory takes the verses about a single blood moon (in Joel 2 and Rev 6) out of context and multiplies the single blood moon by four. Scripture twisting anyone? But what about the other main passage cited by the theory proponents, Genesis 1:14? That does seem at first to support what Biltz and Hagee are saying. We should expect "signs" in the heavens. What kind of signs, exactly? "Warning signs" or "prophetic signs" like Biltz claims? Or something else? Notice that all of the words following the word "signs" modify that word as divisions of time: "seasons, days, and years!" There is no mention in the passage of prophetic or warning signs at all, but rather only timing signs. This makes perfect sense as where would we be without the rising and setting of the sun to mark the day? Or the waxing and waning of the moon to mark month? Or the changing length of the day to mark the beginning of seasons at the solstices and equinoxes? We would have no signals to divide time into "seasons, days, months and years." Genesis 1:14 (NLT) — Then God said, "Let lights appear in the sky to separate the day from the night. Let them be signs to mark the seasons, days, and years. Not only does this fit the context, it is the only type of "sign" we can gather reliably and unambiguously from the heavenly bodies. See, if God meant he would send warning or prophetic signs from the moon like Biltz claims, where are the instructions on interpreting them? There are none! So how is God signaling to us with these heavenly bodies? Morse Code? Smoke signals? FM? HTTP? North American Sign Language?? That's the problem. If, say, God is communicating through eclipses, like Biltz claims, it remains ambiguous what an eclipse means or is communicating. Biltz currently claims it is a warning of judgment. But in 2008 he suggested it was a sign of the second coming of Christ at the last eclipse. Which one is it? See how it is completely subjective what it means and changeable by the whim of the person declaring it? It can mean anything Biltz or anyone says. And we just have to trust their opinion because there is no Bible verse telling us to look for four lunar eclipses or what they mean. In other words, the emperor has no clothes. The only signs Genesis 1:14 tells us to take from the sun moon and stars are ones we all already know about: the common divisions of time like sunrise for the new day or the new moon for the new month.